Enhanced crosswalk warning devices are up and operating at the Liberty Street-Rowland Avenue intersection in the city of Delaware. The rectangular rapid flash beacons are user-actuated LEDs that supplement warning signs at unsignalized intersections, reducing crashes between vehicles and pedestrians. The RRFBs will be installed at crosswalks on Troy Road and Pennsylvania Avenue. 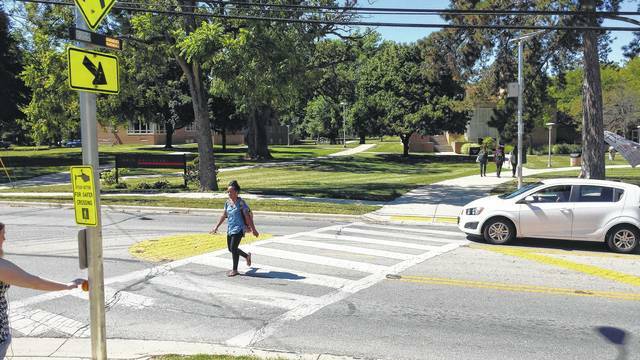 The Ohio Department of Transportation will install warning devices at two crosswalks in the city of Delaware to help improve pedestrian safety. In late June, Delaware City Council authorized the city manager to enter into an agreement with ODOT to install rectangular rapid flashing beacons, or RRFBs, at the intersections of Troy Road and Barrett Street and Pennsylvania Avenue at Heritage Boulevard before the upcoming school year. ODOT will fully fund the $35,800 project. “The team is meeting within the next two weeks to work out specifics,” said Nancy Burton, a spokeswoman for ODOT District 6. The flashing beacons can be activated by pedestrians pushing buttons. Also, the crosswalks will be re-striped with heat-fused preformed thermoplastic pavement markings, which are known to last six to eight times longer than normal traffic paint. The same device was installed in 2016 on South Liberty Street at Oak Hill Avenue and Rowland Avenue. The city submitted the application to fund the latest beacon installations in response to the number of pedestrian-involved accidents and the volumes of school-aged pedestrians using those crosswalks, according to the fact sheet. This project was identified in the Safe Routes to School report presented to Delaware City Schools at a joint meeting with council in February. That meeting was held about a month after an incident on Jan. 4 when a Dempsey Middle School student was struck by a car in the crosswalk at Troy Road and Barrett Avenue, according to The Gazette archives. Delaware police reported Kylie Linville, 13, went over the hood of the car and collided with the windshield before coming to rest on the ground. Linville survived, but suffered fractures to both of her legs. Posts in a Facebook group titled “Love for The Linville’s” indicates that the student started transitioning back to school in March. The driver pleaded guilty to a charge of failure to yield at a crosswalk and paid the court fine of $135. https://www.delgazette.com/wp-content/uploads/sites/40/2017/07/web1_lee.jpgEnhanced crosswalk warning devices are up and operating at the Liberty Street-Rowland Avenue intersection in the city of Delaware. The rectangular rapid flash beacons are user-actuated LEDs that supplement warning signs at unsignalized intersections, reducing crashes between vehicles and pedestrians. The RRFBs will be installed at crosswalks on Troy Road and Pennsylvania Avenue.